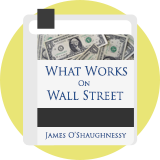 James O'Shaughnessy Tiny Titans is a small-cap momentum investing strategy set out by US fund manager James O'Shaughnessy in his 1996 book, What Works on Wall Street. It combines momentum and value factors and focuses on stocks capitalised at greater than £15m but less than £150m. Its key measures include the price to sales ratio and 1-year relative strength. O'Shaughnessy wrote: "Studies are nearly unanimous in their findings that small stocks (those in the lowest two deciles) do significantly better than large ones. We too have found tremendous returns from tiny stocks." He found that this strategy produced an annual compound return of 20.05% between 1963 and 2009. In 2012, O'Shaughnessy updated the strategy rules by replacing price-to-sales as the key value metric with 6 composited value factors.